Impromptu adventuring, exploring our backyard and then putting pen to paper, hoping to entice you to try one, if not all, of our escapades, is my true reward! Our secret road trip was to reach the Kureelpa Falls, via the Kureelpa Falls Forest Trail in the Mapleton National Park. Alas, with recent rains the creek had swelled to bursting and we only managed to slippery rock slide from one embankment to the other, without reaching the desired trail to access the Kureelpa Falls. As they say in the classics 'we were close, but no cigar'. And a 'must do' excursion for another day that I have bookmarked! Nevertheless, what a secret little gem we discovered - also one that is not on every tourist brochure, so as such is in a totally unspoilt region. The Kureelpa Falls Forest Trail is a scenic, tranquil section of the Kureelpa Falls Circuit (8.5km return) and can be accessed by off-road bikes, walkers as well as horses. I never saw any signage to the contrary so think that dogs might be permitted in this area too - but perhaps an enquiry online here to the relevant authorities would not go amiss. This Forest Trail is within the Mapleton National Park - NOT to be confused with the Mapleton Falls National Park, although the two are quite close to each other in proximity. 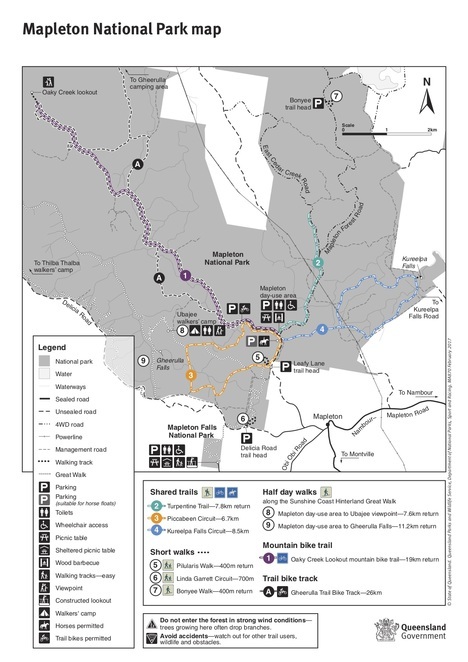 The complete 58km Great Walk actually traverses both of these National Parks - Mapleton Falls National Park is included in section three of the Great Walk whilst Mapleton National Park is included in section four of the Great Walk. The Mapleton National Park is located in the scenic Blackall Range, with a magnificent landscape created by volcanoes and sculpted by water over millions of years. 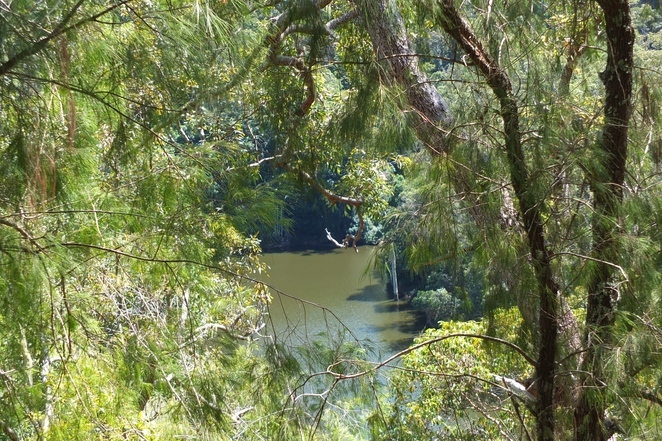 Mountain scenery, numerous creeks, small waterfalls, rocky outcrops with expansive views and diverse forests—rainforest, tall open blackbutt forest, scribbly gum forest, piccabeen palm groves, vine forest and shrubby woodland are all spectacular features within the Mapleton National Park. Take the Mapleton Road from either Nambour or Mapleton and opposite the Dulong Lookout at Kanyana Park turn into Kureelpa Falls Road. Travel along Kureelpa Falls Road, alongside the ridge for exactly five kilometres and the road comes to a gated access to the park, with plenty of room for parking. When we arrived, there was only one other car and by the time we left there were three vehicles - an indication that not too many people are aware of this Kureelpa Falls Circuit access. The last section of Kureelpa Falls Road is a gravel road, but appears to be well maintained by local home-owners and/or Council. A conglomerate rock - thanks to hubby for this info! Once we had parked and gone through the gate, my adventurous other and I found a cleared trail wide enough to take a vehicle. After approximately six hundred metres, we did get to the creek, but as mentioned before the creek was pretty much bursting at the seams, and wasn't keen for us to gain easy access from one side to the other. We did eventually find our way over the creek - and back again - a big accomplishment, without actually falling in. But with all the to-ing and fro-ing, our crossing didn't seem to coincide with finding the elusive trail to the actual Kureelpa Falls. I'm attaching a map, courtesy of the Queensland Government National Parks, (I wish I had this map before we attempted our walk), clearly showing the shared trails and the Kureelpa Falls Circuit. I'm hoping that my readers will get the opportunity to get out into the beautiful Mapleton National Park to access the Kureelpa Falls, especially after the rains. And, if you get there before me, to 'do tell' and let me know about your experience. Hubby and I had a heap load of fun, interspersed with hysterical giggles (from me) with our creek crossing, but even though we didn't get to the Falls, we thoroughly enjoyed our 'short' excursion along the Kureelpa Falls Forest Trail. A variety of bird calls accompanying us on our walk, serving as a further melodic testament to the isolation of this very pretty area. Look out for the tree scrambling monitors successfully blending into the bark of the trees, but giving away their camouflaged positions, by dropping foliage out of the trees. Our short-term goal is a return trip to find the elusive Kureelpa Falls, which according to those in the know, has the Maroochy River cascading over boulders, before falling approximately thirty metres into a hidden gorge. Thanks for including a map. Always makes it easier to navigate. Looks like a good walk! Where Is Your Favourite Op Shop On The Sunshine Coast? Where's the Best Place to View the Sunset on the Sunshine Coast? Where can you Find the Best Seafood on the Sunshine Coast?